This final event is beautiful and elegant, combining the elements of glistening water, shimmering lights, lush greenery and vivid tropical orchids. Our guests will enter the party by crossing over a 12' x 6' oblong reflecting pool on a quaint, antique wooden bridge. 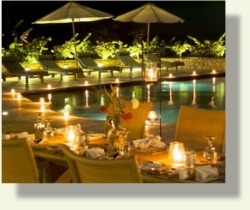 The pool below is a lovely vision of candles, lights, jungle greens and romantic orchid blossoms. Our outdoor function site is further enhanced with an 8' high lava rock waterfall with cascading water, lava rocks, twinkle lights and aromatic florals. Winding through the center of the party is another outrageous sparkling reflecting pool. This one 24' x 12' in diameter and accented with 6' raised and lighted fountains at each end. The dining tables are dressed in pale green linen and highlighted with sprays of white and pink orchids and flickering candle light. A small orchestra serenades guests while a gourmet meal that will tease the appetite and treat the palate is served. Later in the evening, a vocalist joins our musicians and woos guests onto the dance floor with mellow, contemporary sounds. When our evening comes to a close, our guests will stroll leisurely back to their rooms realizing that they have just experienced an incredible week with friends in paradise.